Because what could be scarier than student debt? Trick-or-treating, cotton candy, popcorn and snow cones made for a sweet fix for students on Monday, as the saltiness surrounding student’s tuition fees were the center of conversation. 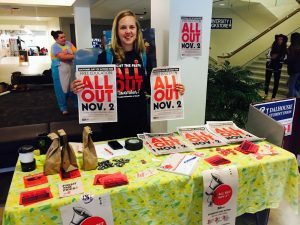 The DSU Student Life committee and External Action committee hosted a Halloween-themed promotional event on Oct. 31 in the Dalhousie Student Union Building lobby to promote the Student Union’s National Day of Action on Nov. 2. Lisa Odland with the DSU works the information table. 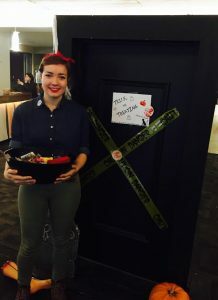 Kelsey Keddy, the Vice President, Student Life of the DSU said that the event was about bringing together the joy of Halloween and hyping up the need for accessible education in Nova Scotia. On the National Day of Action, students at Dalhousie will be meeting in front of the Killam library at 11:30 a.m., and marching to Victoria Park on Spring Garden road to join other groups. From there, students will then continue their march to the Provincial Legislature on Hollis Street. Keddy, along with other students, will be marching on Nov. 2 from Dal campus to advocate for more accessible education for university students. Amongst free tuition, students will also be marching to end unpaid internships and turning student loans into grants. “We see [these options available] in a lot provinces and it’s really realistic, especially for people who come from low economic backgrounds, to be able to get education,” Keddy said. In Nova Scotia, tuition has increased by 17 per cent, which has caused tensions between university students and the provincial government. Keddy stated that Newfoundland is an example of students protesting tuition increases and receiving government action by the province reducing fees. Emmalies Vander-Velde, with the DSU, hands out candy to trick-or-treaters.